Quiet, lightweight, powerful, and versatile! 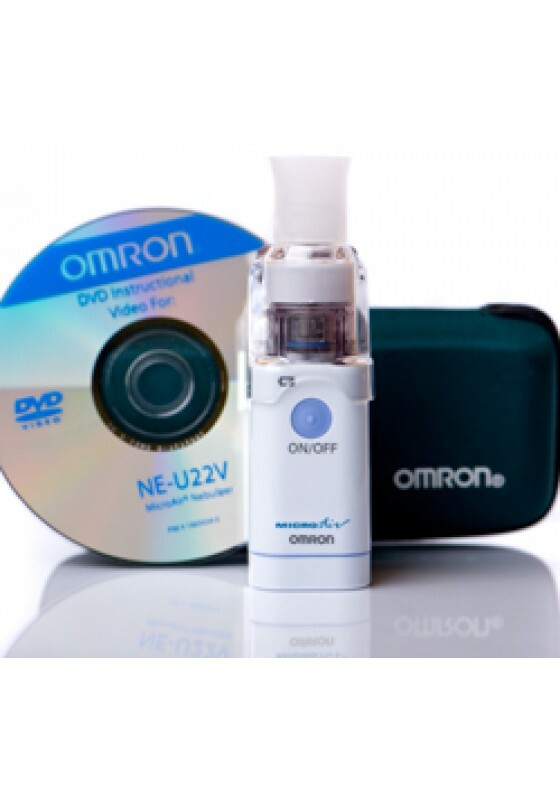 The world's smallest portable nebulizer, Omron MicroAir NE-U22V comes in a size of 4x2x1.5 inch, 10x5x4 cm. This powerful unit outperforms traditional nebulizer compressors. NE-U22V is able to deliver any type of medication (including suspension drugs such as Pulmicort) through nebulization. The Omron MicroAir NE-U22V can operate continuously for over 4 hours (approximately 40-50 treatments) just on 2 'AA' batteries (sold separately). It is perfect for international travel, and it never needs to be plugged in or recharged. Even better, it weighs only 6 ounces (170 g with batteries). It comes with a storage case with similar size as a eyeglass carrying case. An instructional video CD is included to demonstrate proper care and cleaning techniques. Totally silent and able to operate in virtually any position, the Omron NE-U22V can be used by adults as well as children. The MicroAir nebulizer can be used with undiluted medication. The NE-U22V's electronic 'Vibrating Mesh Technology' (VMT) creates a dense therapeutic aerosol spray that assures effective delivery of medication. The metal alloy mesh cap is resistant to corrosion. Truly, this device helps make asthma/COPD/respiratory disorders treatment as simple as possible for both pediatric patients and adults. The MicroAir nebulizes also quickly. You can finish a 3 ml treatment is just about 8 minutes! Quiet, lightweight, powerful, and versatile! 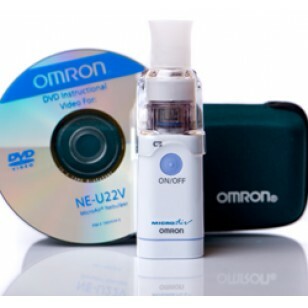 The world's smallest portable nebulizer, Omron MicroAir NE-U22V comes in a size of 4x2x1.5 inch, 10x5x4 cm. This powerful unit outperforms traditional nebulizer compressors. NE-U22V is able to deliver any type of medication (including suspension drugs such as Pulmicort) through nebulization. The Omron MicroAir NE-U22V can operate continuously for over 4 hours (approximately 40-50 treatments) just on 2 'AA' batteries (sold separately). It is perfect for international travel, and it never needs to be plugged in or recharged. Even better, it weighs only 6 ounces (170g with batteries). It comes with a storage case with similar size as a eyeglass carrying case. An instructional video CD is included to demonstrate proper care and cleaning techniques. Totally silent and able to operate in virtually any position, the Omron NE-U22V can be used by adults as well as children. The MicroAir nebulizer can be used with undiluted medication. The NE-U22V's electronic 'Vibrating Mesh Technology' (VMT) creates a dense therapeutic aerosol spray that assures effective delivery of medication. The metal alloy mesh cap is resistant to corrosion. Truly, this device helps make asthma/COPD/respiratory disorders treatment as simple as possible for both pediatric patients and adults. The MicroAir nebulizes also quickly. You can finish a 3 ml treatment is just about 8 minutes! Particle Size Range: 1 to 7 microns. 2 year warranty by manufacturer.